Thank the heavens for Bulletproof coffee. It has been a staple bevy of mine most mornings for a while now, and before this I didn't think it was possible for me to ever be able to have coffee on the daily. Unlike regular coffee, it supports your energy through the entire day, it doesn't cause hormonal imbalances, it's detoxifying, and it supports an intermittent fast perfectly, if that's what you're into. I haven't even mentioned the benefits of the added fats yet. Grass fed ghee, or butter if tolerated, is so beautifully rich in critical nutrients like vitamin A, D, E and K2 as well as the short chain fatty acid, butyrate, which nourishes, reduces inflammation and heals your gut lining. The coconut oil (or upgrade to MCT oil) is incredibly beneficial for your brain and inducing autophagy which is discussed more HERE. It is also a potent anti-fungal and gives you quick and clean energy. The gelatine provides you with amino acids that support and heal the lining of your gut, whilst providing you with the nutrients to enhance the health and strength of your hair, skin, nails and joints. Thank you Dave Asprey for shining light on the blissful outcome of combining fat and coffee. 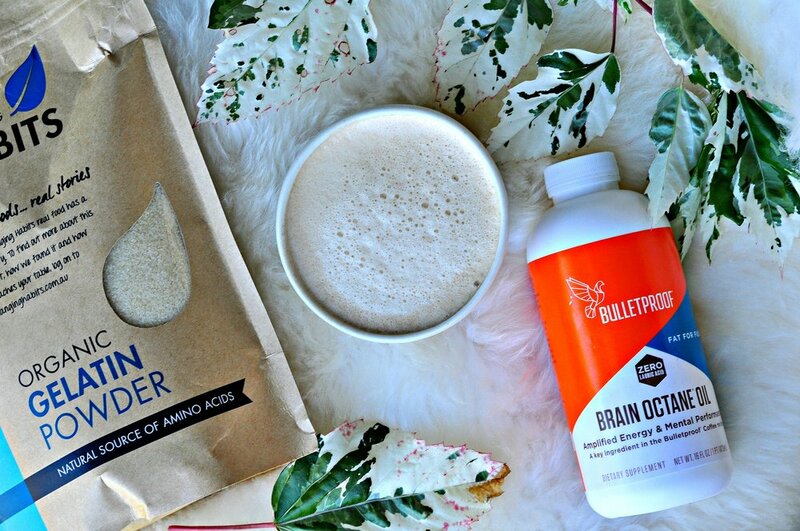 1 tsp of MCT (such as Brain Octane Oil) or 1 Tbsp coconut oil (you can enter JWZ345 for 5% off the Brain Octane). 1/2 to 1 Tbsp organic gelatine - this is optional and not to be included if you are doing an Intermittent Fasting day. Optional: add in 1/2 to 1 tsp ashwaghanda powder which aims to lower your cortisol and support any form of stress or anxiety. I love the brand Sun Potion. 1. Brew your coffee as you desire. I use a plunger, but if you have an espresso machine then of course this is absolutely ideal as you won't get the coffee granule floaties on top. 2. Bloom the gelatine (if you are using it) in just a 1/4 cup of room temperature or cold water. The gelatine makes the coffee extra frothy and creamy. 3. Once the gelatine has absorbed most the water, add all ingredients into your blender and blend until smooth, creamy and frothy!